This image, taken when we first arrived on the job site, shows the dull, dirty-looking marble finish. Here is a closer view of the damaged marble finish. 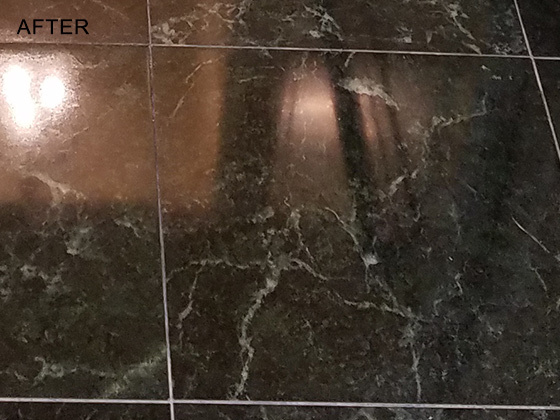 Here is the same marble floor after honing and polishing. What a difference! This is a close up view of the refinished marble floor. 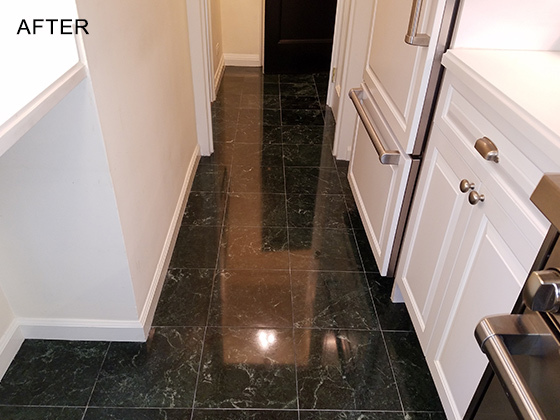 Because of an unfortunate Manhattan apartment plumbing design, several tiles had to be torn out of this marble floor in order to install a washer and dryer. 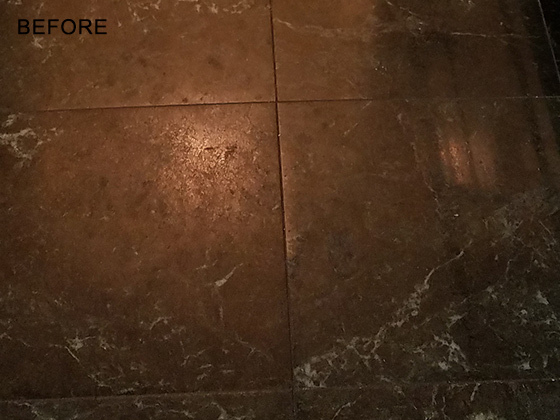 After the repairs, our clients were not happy with the appearance of the floor, because the finish of the new tiles looked perfect, but the surrounding tiles were scratched and dull looking, as you can see in the BEFORE images. The contractors cautioned our clients that they might need to have the entire floor replaced, but that it would require the removal of all the cabinetry. Fortunately, a local tile store recommended that they give us a call, which ended up saving them a lot of time, trouble, and expense. 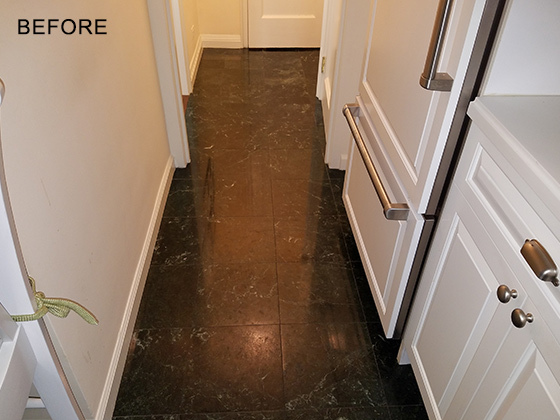 We recommended that they have the marble floor refinished instead of replacing the floor, and they agreed. First, we masked and protected surrounding areas. Then we honed the marble to remove the scratches and other damage and to give the new tiles a “clean slate” so that we could better match the finish. We used a series of progressively finer grits to achieve the elegant, polished finish you see in the AFTER images. Now, the finish is so consistent, only the homeowners will ever know tiles have been replaced. To learn more about marble polishing, watch this short video or visit our Marble & Limestone Services page. For a free estimate on marble floor repair and polishing, as well as restoration services for marble countertops and other surfaces in NY, NJ, and CT, contact us online or call today. We have 3 numbers to choose from 212-777-4040 | 718-776-3564 | 516-377-0993.